(re)set the selector to be used for future calls to rho() etc. Resets the class to its default state, including the choice to use 4-vector areas. Class to estimate the pt density of the background per unit area, using the median of the distribution of pt/area from jets that pass some selection criterion. Events are passed either in the form of the event particles (in which they're clustered by the class), a ClusterSequenceArea (in which case the jets used are those returned by "inclusive_jets()") or directly as a set of jets. The selection criterion is typically a geometrical one (e.g. all jets with |y|<2) sometimes supplemented with some kinematical restriction (e.g. exclusion of the two hardest jets). It is passed to the class through a Selector. For ranges with small areas, this can be inaccurate (particularly relevant in dense events where empty_area should be zero and ends up not being zero). This calculation of empty area can be avoided if a ClusterSequenceArea class with explicit ghosts (ActiveAreaExplicitGhosts) is used. This is recommended unless speed requirements cause you to use Voronoi areas. For speedy background estimation you could also consider using GridMedianBackgroundEstimator. Definition at line 80 of file JetMedianBackgroundEstimator.hh. Constructor that sets the rho range as well as the jet definition and area definition to be used to cluster the particles. Definition at line 84 of file JetMedianBackgroundEstimator.cc. one should be able to estimate the "empty area" (i.e. the area not occupied by jets). This is feasible if at least one of the following conditions is satisfied: ( i) the ClusterSequence has explicit ghosts (ii) the range has a computable area. Note that selectors with e.g. hardest-jets exclusion do not have a well-defined area. For this reasons, it is STRONGLY advised to use an area with explicit ghosts. Definition at line 101 of file JetMedianBackgroundEstimator.cc. Default constructor that optionally sets the rho range. The configuration must be done later calling set_cluster_sequence(...) or set_jets(...). Definition at line 124 of file JetMedianBackgroundEstimator.hh. Definition at line 117 of file JetMedianBackgroundEstimator.cc. (re)set the cluster sequence (with area support) to be used by future calls to rho() etc. one should be able to estimate the "empty area" (i.e. the area not occupied by jets). This is feasible if at least one of the following conditions is satisfied: ( i) the ClusterSequence has explicit ghosts (ii) the range selected has a computable area. Definition at line 160 of file JetMedianBackgroundEstimator.cc. (re)set the jets (which must have area support) to be used by future calls to rho() etc. ; for the conditions that must be satisfied by the jets, see the Constructor that takes jets. Definition at line 184 of file JetMedianBackgroundEstimator.cc. get rho, the median background density per unit area, locally at the position of a given jet. If the Selector associated with the range takes a reference jet (i.e. is relocatable), then for subsequent operations the Selector has that jet set as its reference. Definition at line 250 of file JetMedianBackgroundEstimator.cc. get sigma, the background fluctuations per unit area, locally at the position of a given jet. Definition at line 265 of file JetMedianBackgroundEstimator.cc. Definition at line 292 of file JetMedianBackgroundEstimator.cc. Definition at line 237 of file JetMedianBackgroundEstimator.hh. Returns the mean area of the jets used to actually compute the background properties in the last call of rho() or sigma() If the configuration has changed in the meantime, throw an error. Definition at line 246 of file JetMedianBackgroundEstimator.hh. 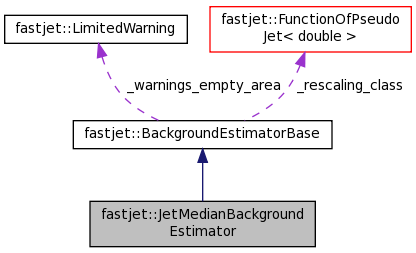 returns the number of jets used to actually compute the background properties in the last call of rho() or sigma() If the configuration has changed in the meantime, throw an error. Definition at line 256 of file JetMedianBackgroundEstimator.hh. Returns the estimate of the area (within the range defined by the selector) that is not occupied by jets. The value is that for the last call of rho() or sigma() If the configuration has changed in the meantime, throw an error. The answer is defined to be zero if the area calculation involved explicit ghosts; if the area calculation was an active area, then use is made of the active area's internal list of pure ghost jets (taking those that pass the selector); otherwise it is based on the difference between the selector's total area and the area of the jets that pass the selector. The result here is just the cached result of the corresponding call to the ClusterSequenceAreaBase function. Definition at line 290 of file JetMedianBackgroundEstimator.hh. Returns the number of empty jets used when computing the background properties. The value is that for the last call of rho() or sigma(). If the configuration has changed in the meantime, throw an error. If the area has explicit ghosts the result is zero; for active areas it is the number of internal pure ghost jets that pass the selector; otherwise it is deduced from the empty area, divided by (the average pure-ghost-jet area). Definition at line 309 of file JetMedianBackgroundEstimator.hh. By default when calculating pt/Area for a jet, it is the transverse component of the 4-vector area that is used in the ratiof . Calling this function with a "false" argument causes the scalar area to be used instead. While the difference between the two choices is usually small, for high-precision work it is usually the 4-vector area that is to be preferred. Definition at line 338 of file JetMedianBackgroundEstimator.hh. The FastJet v2.X sigma calculation had a small spurious offset in the limit of a small number of jets. This is fixed by default in versions 3 upwards. The old behaviour can be obtained with a call to this function. Definition at line 350 of file JetMedianBackgroundEstimator.hh. Set a pointer to a class that calculates the quantity whose median will be calculated; if the pointer is null then pt/area is used (as occurs also if this function is not called). Definition at line 358 of file JetMedianBackgroundEstimator.cc. Definition at line 377 of file JetMedianBackgroundEstimator.hh.